Wait, what happened to ... Joe Coleman? It’s been difficult to get a read on Joe Coleman all season. Sure, the guard is still a sophomore and has plenty to learn. And when you look at the totals, Coleman’s numbers have pretty much gone up across the board compared to his freshman season. So you’ve got to give him props there. But the concern is that, in the conference schedule this season, Coleman had been inconsistent at best, and regressive at worst. A year ago, he was a new instillation in the starting lineup, and therefore didn’t have the same opportunities to pad his stats in the non-conference schedule. He certainly did that this season, averaging 10.2 points as the team headed into the Big Ten slate. In the last seven games, he’s averaged just 5.1 points a contest. Wednesday wasn’t the first time Coleman went scoreless in this league schedule – he also did so at Ohio State on Feb. 20. In between he had a pretty solid game against Indiana (nine points, five rebounds) and then had an energizing, 12-point performance off the bench against Penn State. But when Smith brought his wing off the bench for a second time, Coleman had a hard time even getting involved. The guard didn’t attempt a single shot from the field, and went 0-for-1 from the free throw line. Why the inconsistency? Why is it that Coleman can show such aggressiveness and attack in moments and look totally lost or disinterested in others? It wouldn’t be shocking if Coleman was a little, shall we say, surprised by the lineup on Wednesday, even though the group that played had been practicing together quite a bit that week. Taking Coleman out of the starting five – at least for a while – is probably the right choice, as I have been saying for sometime. 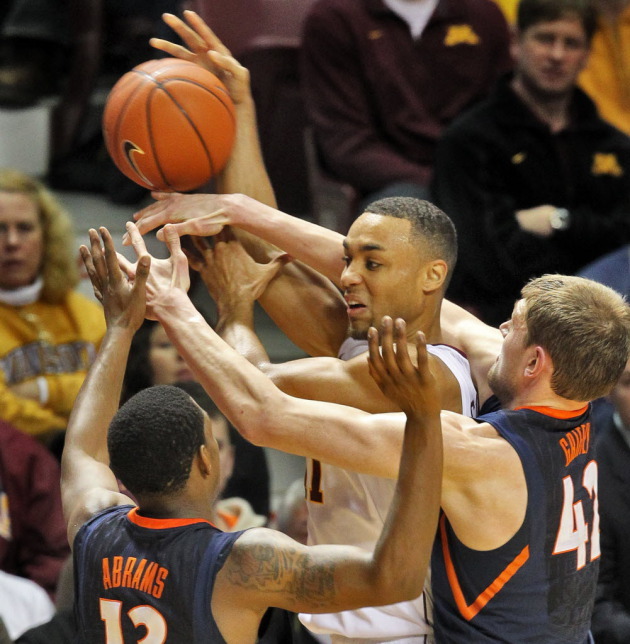 But doing it in that manner – starting both Julian Welch and Andre Ingram, who has done some really nice things for the Gophers, but simply doesn’t belong in that role – was questionable and probably difficult to understand from both Coleman and Andre Hollins’ perspectives. Coleman’s strengths should lie in bringing a spark of energy – whether at the start or in reserve -- and scoring potential in driving to the basket and drawing fouls. But it’s possible that coming off the bench, or playing fewer minutes in a given game, will have a mental effect on the sophomore, given that he’s been starting consistently since the middle of last season. Is it possible coach Tubby Smith gave Coleman that role too quickly, setting him up for a letdown later? At this point, removing Coleman from the starting lineup as the team heads into the postseason could remove his impact significantly. Wait, what happened to ... Austin Hollins?